I’m so excited to have my friend Lori Wildenberg sharing with you today! She’s an amazing author, speaker, mom and licensed family educator. She’s also a fun, funny, super smart woman – the type of person you admire within a few minutes of meeting. She and her coauthor Becky Danielson are launching their two books Raising Little Kids with Big Love and Raising Big Kids with Supernatural Love this month and giving away over $400 in gifts! Don’t miss the details at the end of Lori’s post, along with information on how YOU can enter to win! Have you ever had your child miss the school bus because she was on the toilet? Have you ever had your preschooler help himself to cereal, only to dump it all over the floor? Have you ever had your daughter insist on wearing only swing-around dresses, multiple headbands, and dishtowels on her head (going for the shepherd girl look) , or a son who wears buckets on his head? Yes to all of the above at the Wildenberg house. And my guess is… you have your own crazy, because you are a mom! This is what my friend, Genny, would call Mommy Bliss; the moments where we choose joy over un-joy. Sometimes that isn’t easy. I covet my time so anything that gets in the way of my schedule is the obstacle to my mommy bliss. When my college-age daughter needed to get a new license, we waited at the DMV for two hours… (you feel my pain, don’t you?) We made the best of it. Walked to the Subway shop next door and had lunch. Then we returned to the DMV to sit in the hard, smashed together chairs. But we were talking and laughing. Time with my kid. Precious. I had bliss and a good perspective. Two hours. So what? Finally number 234 was called. We approached the attendant. I had the check book, all set to take care of business. Do you have them in or with you? You will have to get your glasses or contacts and come back. Can we go to the front of the line when we return? Irritation replaced the bliss. In a show of total resignation, I dramatically dropped my forehead to the counter. Ma’am you need to step away from the counter so I can help the next person. I now had the chance to choose. I could make this a humorous memory or one that put a wedge between my daughter and me. Praise God he broke through my annoyance and showed me something better. This was just a day. But a day with my daughter. So I chose bliss. God has shown me that parenting is all about love: decision making, action taking, strength giving love. The love found in 1 Corinthians 13. 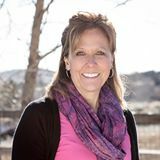 Lori Wildenberg, co-founder of 1 Corinthians 13 Parenting and co-author of three parenting books, is a mom of four who loves to encourage and support parents in their quest to be the mom or dad they want to be. Raising Little Kids with Big Love and Raising Big Kids with Supernatural Love are books that help moms (and dads) parent in a way that builds relationships to last a life time. The fifteen character qualities of love and four different yet successful parenting styles are woven into the fabric of the text. In the midst of little kid tantrums or big kid teen attitude (you know the big sighs and rolling eyes) we can still parent in a way that grows our kids’ character (and ours) and increases desirable behavior. Check out the list of how-to’s these books will help you with HERE! During the LOVE Month, February, my co-author and I are celebrating. 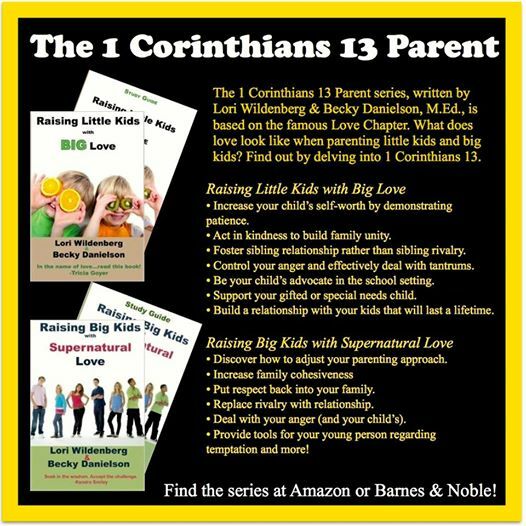 The 1 Corinthians 13 Parent Series: Raising Little Kids with Big Love and Raising Big Kids with Supernatural Love and their companion study guides, is being formally launched. So…Becky Danielson and I wanted to spread a little love around. We are giving away over $400.00 of gifts: books, jewelry, and one-on-one parent coaching with either Becky or me (we are both licensed parent and family educators.) See some of the gifts HERE! 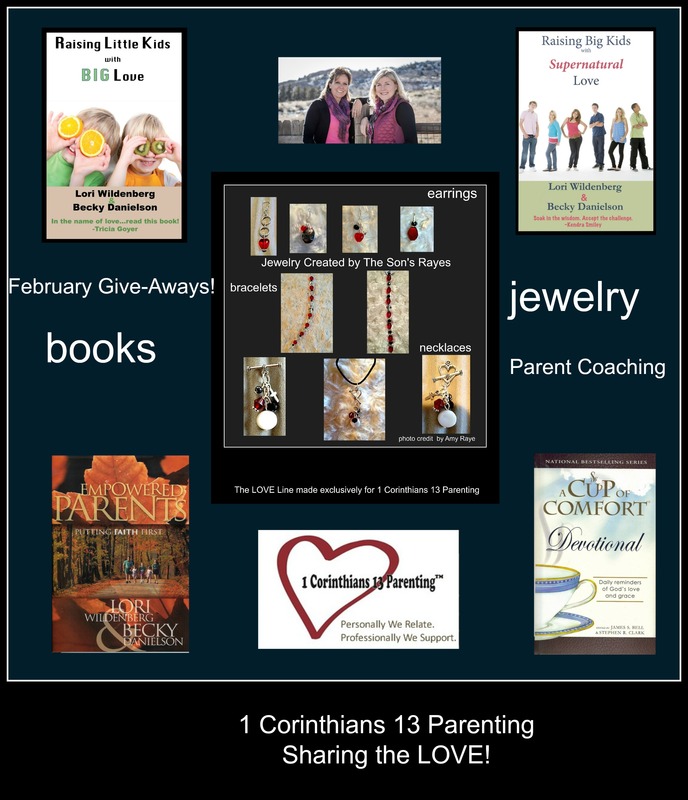 To be eligible for the gifts, comment on this blog post or on an article over at http://www.1Corinthians13Parenting.com during the month of February. Winners will be randomly drawn each Friday and notified via email. Thank you for sharing in this special month long event! If this post was a blessing to you, head over to Amazon or Barnes and Noble where you can find more great faith-based and easily applicable tips and information in our newly released books: Raising Little Kids with Big Love and Raising Big Kids with Supernatural Love.